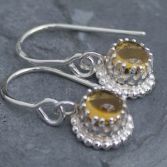 These Opulent Citrine Dangle Earrings have an ornate setting which shows off the semi precious gemstone beautifully. 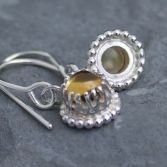 The setting has been handcrafted by me and designed to allow light to reflect through the gemstone to highlight the vibrant rich golden tone of these large Citrine cabochon gemstones. Other gemstones are available, choose from a rich purple Amethyst cabochon, Dark Smoky Quartz, Red Garnet or milky white iridescent Moonstones see other listing. 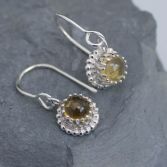 Your Opulent Citrine Dangle earrings are available in two finishes a bright silver finish or a blue black oxidised polished silver finish, please choose using the drop down option below. 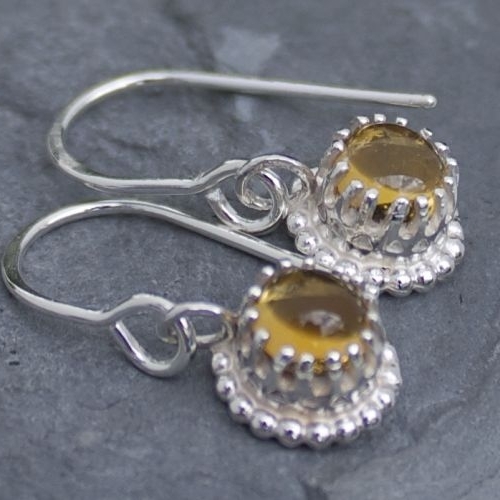 The Opulent Citrine Dangle earrings hang from my handcrafted sterling silver ear wires which are made from 0.8mm solid sterling silver wire, the earrings have full hallmarks stamped at the UK Edinburgh Assay Office. 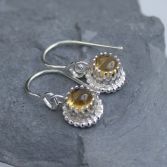 Your Opulent Citrine Dangle Earrings will be presented to you in one of our signature gift boxes and posted via Royal Mail 1st class delivery (signed for) to any UK address free of charge.